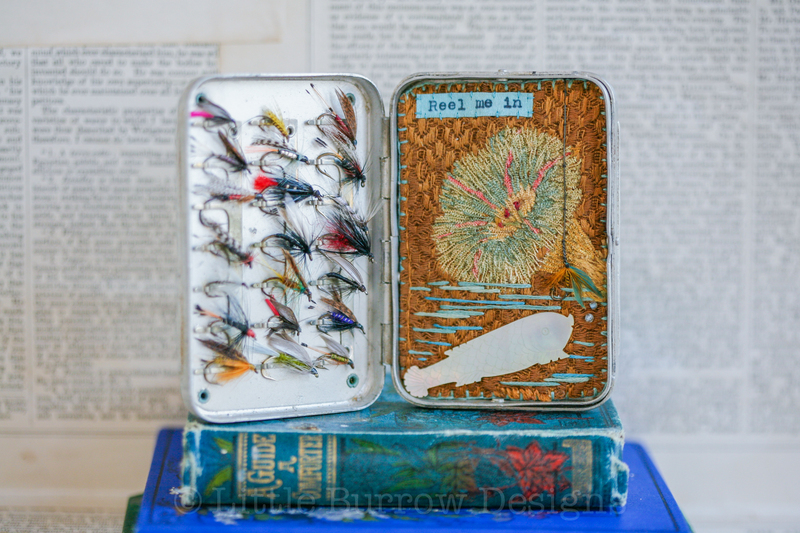 The body of this work is housed in a small Wheatley’s fishing fly box, circa mid 1900’s. Inside the main body, the background comprises of a wonderful vintage chenille embroidered flower, on a textured background. This is a tiny fragment of Victorian curtain, circa 1890’s. On to this is embroidered water ripples, and a single real vintage fishing fly. The fly dangles from a wire, enticing the fish below, which is an early 1800’s mother of pearl carved fish gaming counter. Tiny bubbles can be seen escaping the fish’s mouth, which are vintage glass beads. On the other side of the storybox is an array of vintage fishing flies. These can all be removed, and used as they were originally intended, if you so wish.